The black beauties have got a special charm. Their looks are certainly distinct from others and the same applies to their crowning glory too. Their dark tresses that mostly come in curls are worn in various manners by the girls. Since, the present times are all about sporting short hairdos, the black beauties have also adopted mini, bob hairstyles. The sources of inspiration are also not very far away as some of topmost black celebrities are in the same league, flaunting their bob hairstyles with élan. There are various bob hairstyles for black women that can be tried out in unique manners. Starting with the simple, short versions to the funky, layered ones; bob hairdos are something that adds oodles of saucy dimensions to the looks of the girls. Therefore, it is suggested that they go for the shorter versions as people love to watch them in this cool haircut. Below we have presented 30 bob hairstyles for black women that give a glimpse into the varied looks that come to adorn the black beauties once they chop off their tresses. Take a look and watch out the excellent images and we are sure you would love them. If you liked our selection, perhaps these other posts will interest you too, Short Bob Hairstyles, Angled Bob Hairstyles, Curly Bob Hairstyles and Long Bob Hairstyles. The rock star looks fabulous in her concave bob haircut hanging along the face in a sleek manner. Neck length, even dark hair having long, eyebrow grazing bangs frame the face in a graceful manner. Displaying a fine look, this concave shaped bob hairstyle with its pointed edges flatters the face in a cool manner. Chic bob haircut worn with a side parting that frames the face in a perfect manner. Short bob hair reaching up to ear lobes and having side-swept layers on top makes for a bewitching look. Worn in a side-parted manner, this bob hairstyle having asymmetric edges enhances the charm of the black girl. The black beauties with different bob hairstyles, standing together, create a cool portrait. The black girl, wearing goggles and the short bob hairstyle with slight layers, looks quite smart and sleek. Short and thick hair done in a cool manner with a slight shaved back and asymmetric edges on corners. The African queen looks hot in her symmetric and short, bob hairstyle worn in cool, side-parted manner. The black woman wears a mini version of the bob hairdo with longer edges and a shorter, shaved back. Jet black, dark hair displaying brownish blonde under tones, done in a bob cut way, creates a stylish look for the girl. Short bob haircut gracing the bouncy curls of the black beauty is a treat to watch as it creates a distinct look for the girl. The twin tones of light and dark chocolate-brown in the bob hairstyle bring out an eye-catching look for the girl. Short and layered bob hairstyle that is heavier on the top makes for a smart and comfortable portrait. Classy short bob hairstyle with golden blonde highlights sitting on the mane of the black woman look elegant. Curls reaching up to neck done in the stylish bob cut manner create a sassy look for the girl. Smooth, silky and soft, this black bob hairstyle is definitely going to make the heads turn with its amazing look. Short bob hairdo worn in a side-parted manner with asymmetric edges gracing the face as ear locks. Check out this god-gifted natural bob hairstyle gracing the mane of the beautiful, black girl. The black woman has got a graceful short bob hairstyle that is done in layers and worn with a side parting. The African girl has got a massive, bob style wig displaying twin shades of light and dark brown. This black girl has got a charming hairstyle having purple tint all over the tresses worn with a side parting. 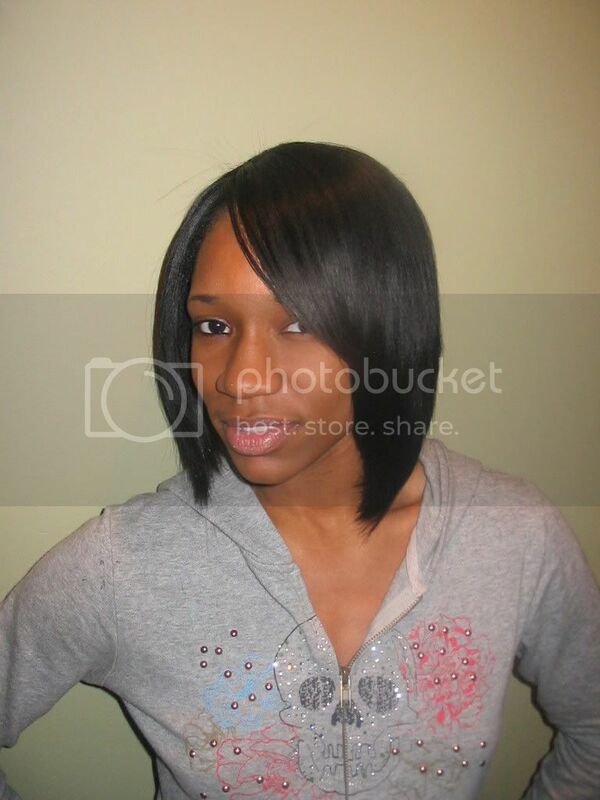 The long version of the bob hairstyle having dark chocolate shade and pointed edges looks awesome. Dark and layered, short bob haircut adorned by a floral hair band looks quite cute. Even length, bob haircut done on thick tresses and adorned with a cap that has got angular edges kissing the cheeks. Layered bob haircut exhibiting light brown and dark shades that enhance the appeal of the black girl million times. Asymmetric bob hairstyle having light brown undertones and deep, even length bangs looks fabulous. Short and dark hair having twists and braids worn with a center parting that looks quite cool. Short and dark hair having short layers worn with a side parting that is plain but sweet to look at.